About Distance Learning Why Choose City Vision University? City Vision University is TechMission's accredited online university. Its mission is to provide radically affordable Christian education to underserved communities via distance learning. It offers practical education in Business Administration, Addiction Studies, Nonprofit Management, Urban Missions, and Technology Ministry. The university is based in Kansas City, Missouri. City Vision University was established in 1998 as Rescue College by the Association of Gospel Rescue Missions to train leaders and workers at their member missions. It was accredited by the Distance Education Accrediting Commission in 2005. In 2008, Rescue College became a program of TechMission and was renamed City Vision College. In fall of that year, it began to offer an Addiction Studies program that had been developed in partnership with the NET Institute. It provides training in the Twelve Core Functions of the Substance Abuse Counselor, and is designed to prepare students to attain the Certified Addiction Counselor credential in the states in which they reside. In 2014, the college began offering a master’s degree in Technology and Social Entrepreneurship (MTSE). 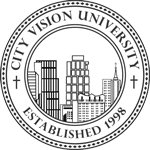 In 2015 it became City Vision University and started offering its Business Administration program. It also launched new initiatives to partner with unaccredited educational institutions in the US for Prior Learning Assessment credit, and with international colleges to provide the "top-up degree" to finish their educational program. Enrollment is open year round in the university's certificate or degree programs. Students may pursue certificates or bachelor's degrees in Business Administration, Addiction Studies, Nonprofit Management, or Urban Missions; an associate's degree in Business Administration; or a Master's in Technology and Social Entrepreneurship. Certificates are awarded to students who complete 30 hours of courses in one of these areas of concentration but do not have sufficient transfer credits to earn a degree. Individual courses can also be taken for personal enrichment and professional development. Several courses can be used to fulfill the initial educational requirements of the CFRE credential for fundraising professionals and its on-going continuing education requirements. The university is also an Approved Academic Education Provider for NAADAC, the association for addictions professionals.